If you use DD-WRT flashed router as a main router, OpenVPN can NOT be used with Static IP or PPPoE. We recommend to use DD-WRT flashed router as the second one. 1. Download the OpenVPN configuration files (UDP or TCP) from the Downloads area, unzip them, and write down the server IP address and protocol you want to connect to. 2. Connect to your router. To do that you have to enter the following address in your browser: http://192.168.1.1. Also, if you are connected to your router via Ethernet, set your network connection to obtain the IP address automatically. 4. Go to the “Security” tab (1) and choose “Firewall” (2). Then, set “SPI Firewall” to “Enable” (3). 5. 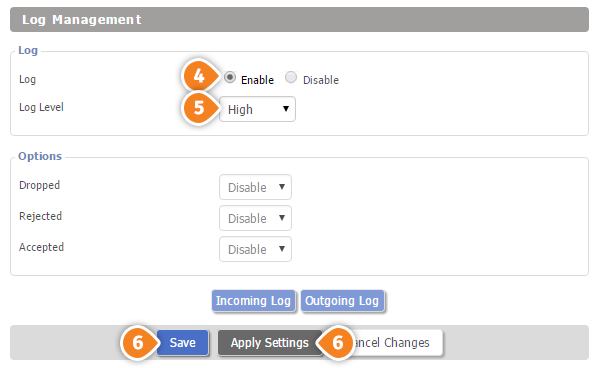 At the bottom of this page you will have to set “Log” to “Enable” (4) then set it to “High” (5). Click on “Save” (6) and “Apply Settings” (7). 6. Click on “Services” tab (8), then choose “VPN” (9) and set the “OpenVPN Client” to “Enable” (10). In the username and password fields type your VPN username and password associated with your VPN Premium service - Please make sure to use the VPN username and password dedicated to the VPN product, NOT the client area credentials. 8. You'll now need to fill the “CA Cert” field on the same page. Go back to the unzipped OpenVPN directory from step 1 above. View the OpenVPN config file (with the extension .ovpn) of the server you need to connect to using Notepad or a similar text viewer. For instance, if you want to connect to our France server using the UDP protocol, you have to view the France 108.61.123.152 - UDP.ovpn file. 9. Find the lines that begin with “<ca>”. 10. 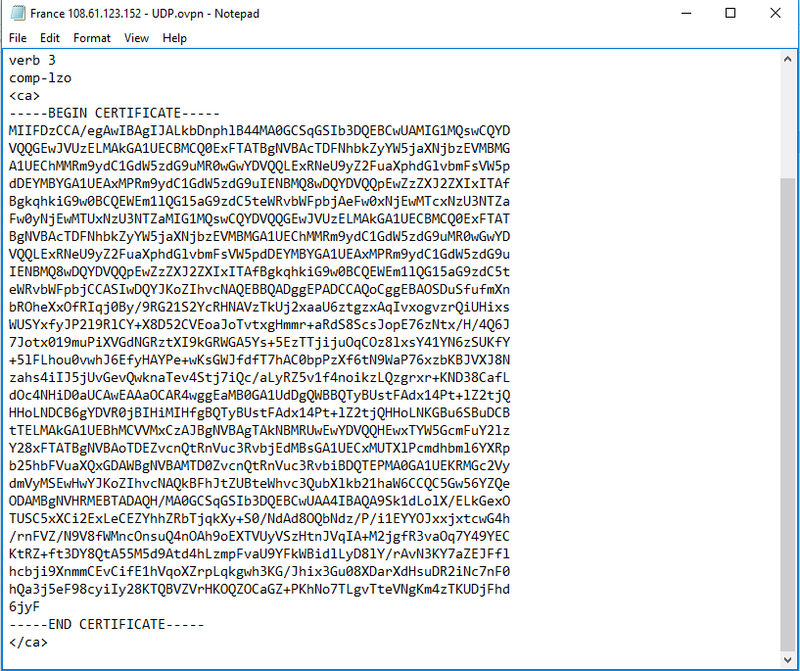 Copy the text you see inside the <ca> and </ca> tags and paste it to the “Ca Cert” field (15). Leave the “Public Client Cert” (16) and “Private Client Key” (17) fields empty. 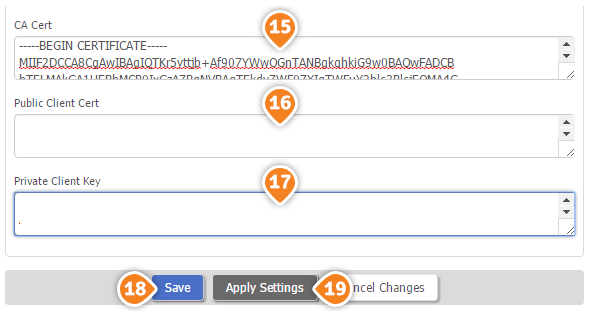 Once finished click on “Save” (18), then click on “Apply Settings” (19). 11. Now go to “Status” tab (20) and choose “OpenVPN” (21). You should see “Client: CONNECTED SUCCESS” message (22). 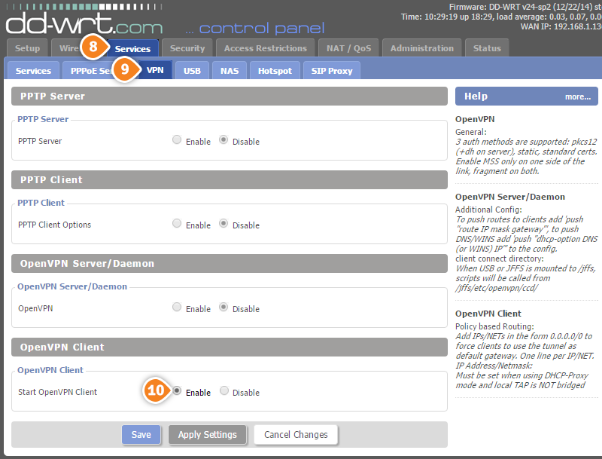 This means the OpenVPN connection on DD-WRT router is created and it is ready to use. 12. The connection is now created and ready to use. To verify that you are connected to a VPN server, please go to whatismyipaddress.com and check whether your IP address and location have changed.